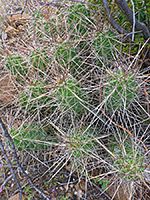 This Texan species of hedgehog cactus forms extensive clumps of large stems (each up to 12 inches tall and 4 inches in diameter), covered by long, yellow/white spines, which vary in density. 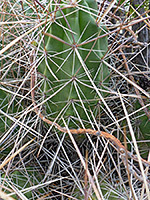 Often the stems of echinocereus enneacanthus lie partly flat against the ground, rising upwards at the ends, and are usually dark green in color, becoming yellowish in areas of strong sunlight. The lightly spined, greenish brown fruits which follow the large pink flowers have a taste similar to a strawberry so are often eaten, especially in Mexico, where they are known as pitaya. Two varieties are recognized: var enneacanthus grows close to the Rio Grande in the west and forms large, sprawling clusters of densely-spined stems, while var brevispinus, also exclusive to Texas (east of Big Bend), forms more open clusters, of stems bearing a much lighter covering of spines, with 8 to 10 radials and 1 to 4 centrals.